Here at Brindley Beach we’ve written a lot about how great a place the Outer Banks is for running, but for some reason we haven’t really talked about bike riding too much. That’s a mistake on our part, because it would be hard to find a better place to ride a bike than the Outer Banks. For our visitors in Corolla, the whole area around Corolla Village and Corolla Light is designed for bike riding. Nicely shaded multi-use paths and no hills make this area the perfect place for a family bike ride. South of Timbuck II the shoulder of NC 12 serves as a bike path, and it’s not suitable for younger riders. For our visitors in Duck and Southern Shores, miles of interconnecting bike paths make northern Dare County the perfect place for a family outing or a more challenging ride. Actually the Outer Banks bike trails are interconnected all the way from Duck to South Nags Head. It is possible to ride from the the Sanderling in Duck all the way to the Wright Brothers Monument in Kill Devil Hills on bike paths. Should you decide to take the challenge, it’s a 33 or 34 mile round trip, so take extra water. 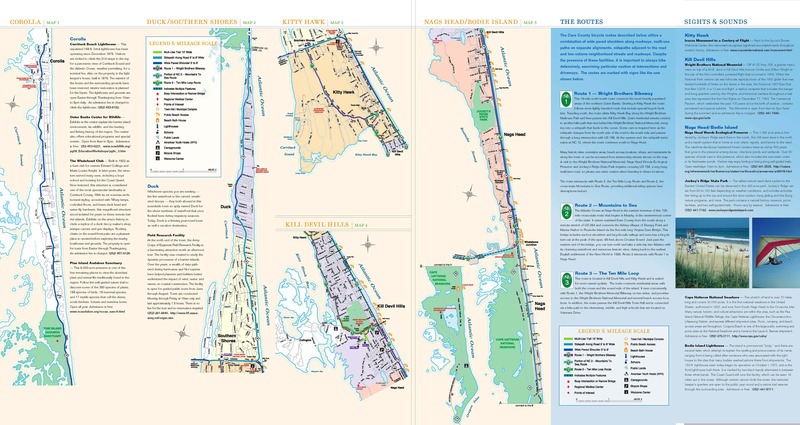 The Outer Banks Visitor’s Bureau has a bike map on their website that is helpful, especially in identifying some of the easier rides.